Standard: GJL200 Cast Iron with AISI 430 or AISI 316 shaft and Cast Iron GJL200 or BRASS according to the pump size. 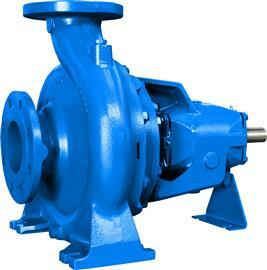 Centrifugal pumps with closed impeller according to EN 733 norms. Discharge sizes from DN 32 to DN 150. RN pumps can handle clean and non-aggressive liquids for the pump materials (contents of solids up to 0,2% max). They are also used for non aggressive industrial liquids, water supply, heating, conditioning, cooling and circulation plants, civil and industrial applications, fire-fighting plants and irrigations. RNB: Independent frame with oil lubricated bearings. RNL: As above with lantern for coupling to flanged motors. RNM: Close-Coupled with electric motor.